All Murelle Equipe modular systems are equipped with 35, 50, 70 or 110kW condenser coil exchangers, characterised by high yield. The combustion of methane generates water vapour, which in traditional boilers is conveyed to the outside through the release of heat from the chimney. The technology used in Murelle Equipe modular systems allows for the recovery of this heat with the main exchanger constructed of stainless steel, which resists the corrosive action of the condensate. 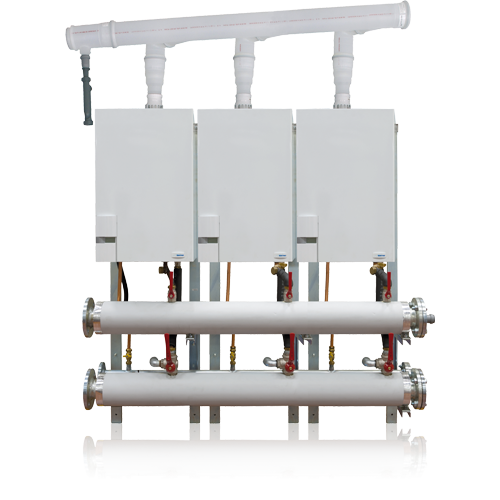 Its cylindrical shape (single for the 35, 50 & 70kW models and overlapping double for 110kW models) ensures the best possible heat exchange and collection of condensate. The radial pre-mix burner is also made of stainless steel and positioned at the centre of the combustion chamber to produce a ‘micro-flame’ at low temperature, which reduces the production of pollutants (CO and NOx) significantly. The air and the gas are pre-mixed in an ideal balanced ratio meaning that the efficiency of this combustion process results in condensation which replaces the heat that would be lost via the flue in conventional boilers.